Product #20489 | SKU 7576 | 0.0 (no ratings yet) Thanks for your rating! 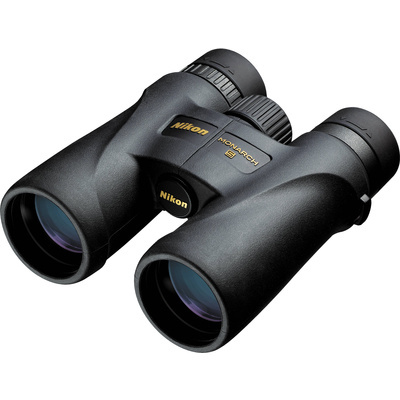 The 8x42 Monarch 5 Binocular from Nikon combines fully multicoated optics with a rubber armored fogproof housing to produce the image quality and handling that is characteristic of Monarch series binoculars. This iteration of the Monarch 5 features extra-low dispersion (ED) lens elements that transmit bright images with enhanced color fidelity and contrast. To preserve the image quality of these high-transmission lenses, Nikon also outfitted this Monarch 5 with phase-corrected roof prisms. Using dielectric coatings, these prisms align incoming wavelengths of light and render well-defined edges with lifelike color. This version of the Monarch 5 all-terrain binocular boasts the same weatherproofing and functionality as its predecessor. The 8x42 configuration of the Monarch 5 has a 6.3° angle of view and can focus to within nine feet, making this set of glasses well-suited for birding, hunting, and almost any close to mid-range glassing activity. A nitrogen-filled fogproof housing provides this set of binoculars with the build quality needed to endure a long day of observation in unforgiving conditions. Non-slip rubber armoring, twist-up eyecups, and a comfortable 19mm eye relief equip the Monarch 5 binocular with the features needed for reliable and comfortable outdoor viewing.